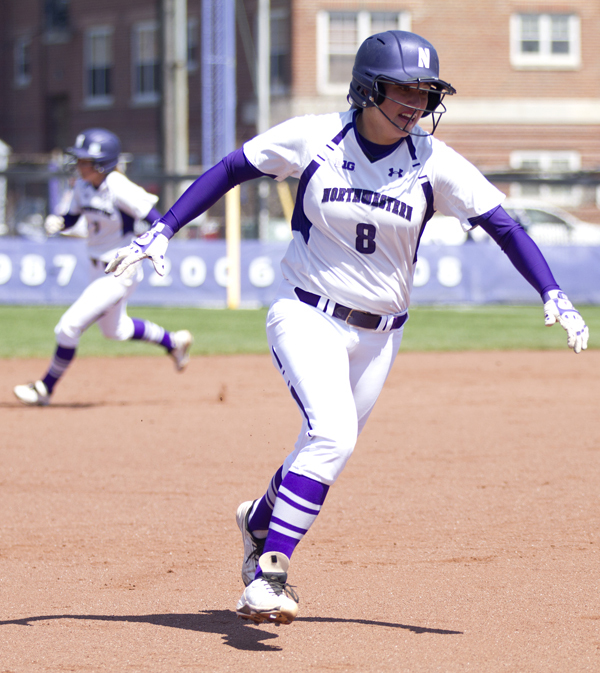 Northwestern softball, winners of 17 of their previous 19 games, entered its weekend series against No. 15 Minnesota looking to extend its undefeated conference streak. Instead, the Wildcats left the Twin Cities with three straight losses. A 3-2 Notre Dame walkoff win on Wednesday makes Northwestern’s (20-15, 8-3 B1G) upcoming series at Nebraska (23-18, 10-4) a pivotal one in the Big Ten standings. Both teams stack up seemingly evenly on the mound. Amy Letourneau will likely take the circle in the opener on Friday after two consecutive starts by Kristen Wood. Letourneau is 11-9 on the season with a 4.99 ERA, and has won 10 of her last 12 decisions. She did give up eight runs in her last outing against Minnesota but the Gophers are arguably the second-best hitting team in the Big Ten. Wood (9-6) had a series to remember against Purdue earlier this month, breaking her single-game strikeout record twice en route to earning a win and a save. Last weekend against Minnesota was a series to forget — Wood gave up 21 earned runs in nine innings pitched. However, Northwestern’s 4.57 team ERA is a touch better than Nebraska’s 5.00. Led by Emily Lockman, Cassie McClure and Kaylan Jablonski, the Cornhuskers’ pitching staff trails only the ‘Cats in many pitching categories, but they’re last in the conference in strikeouts and allow opposing teams to hit .302. Northwestern, meanwhile, ranks second and fourth in the Big Ten in hits allowed and runs allowed, respectively. Nebraska’s offense is one of the best in the Big Ten. The team ranks third in both team batting average (.340) and walks (151). Simply put, they know how to get on base. A big reason for the team’s offensive excellence is sophomore infielder M.J. Knighten, the team’s batting average and hits leader. Though she puts up big numbers against conference and non-conference opponents alike, her Big Ten stats are especially scary. In 14 Big Ten games, she’s hitting .531 and slugging .939. Even if the Wildcat pitchers are able to stifle Knighten, they have to deal with outfielder Kiki Stokes, who is batting over .420 this season. The ‘Cats do have weapons of their own, particularly in the form of outfielder Andrea DiPrima and infielder Andrea Filler. DiPrima leads the Wildcats and ranks fifth in the Big Ten with a .419 batting average and is tied with Filler for the team lead in home runs with eight. Filler leads the team with 42 RBIs on the season and her .382 batting average is second only to DiPrima. Both teams have solid players who can contribute on offense but the Huskers ultimately have the upper hand at the plate. Knighten and Stokes arguably form the conference’s best one-two punch. It will be interesting to see how Letourneau and Wood handle the Cornhusker lineup. They didn’t have their best stuff during the Minnesota series, and Nebraska’s offense is also capable of scoring double-digit runs. The key for Letourneau and Wood will be keeping strikeouts high and walks low. Of course, this is easier said than done – only two teams in the Big Ten get on base more often than the Huskers. Ultimately, Northwestern really needs the bats to come alive in Lincoln after scoring just nine runs total in their last four games. If the ‘Cats can pounce on Lockman early, they should be able to win at least two games and remain in the top three in the conference standings.